1 big thing: Global debt — where do we go from here? Last year, the world's debt rose to $244 trillion, or 318% of global GDP, the Institute of International Finance (IIF) found. The two largest contributors to the rise in debt have been emerging market corporate entities and developed market governments. Governments in developed countries like the U.S., Japan and Europe, "have done very little to bring down debt in recent years despite low borrowing costs and the recent pickup in growth, which should have encouraged them to reign in budget deficits," IIF's Managing Director of Policy Initiatives Sonja Gibbs said. "A good example is the U.S., which has not run an annual budget surplus since 2001." The world is now "pushing at the boundaries of comfortably sustainable debt," she says. Why it matters: In times of economic strength countries have traditionally reduced their debt, seeking balanced budgets and a safety net for the future. But over the past few years the world's largest economies have done just the opposite. The U.S. added close to $2 trillion in fiscal stimulus to its debt, with increased spending and a massive tax cut, in 2017. The euro zone recently ended $2.5 trillion in monetary stimulus, though European Central Bank head Mario Draghi suggested that end may be temporary. Japan just approved an all-time-high $860 billion budget in addition to $3.5 trillion in monetary stimulus from the Bank of Japan. However, "after two years of solid expansion the world is growing more slowly than expected and risks are rising," IMF Managing Director Christine Lagarde said at the World Economic Forum's opening this week. Making matters worse: Emerging economies also have borrowed at an unprecedented rate and at a time when global interest rates are rising and the dollar has strengthened, meaning the loans will cost more to pay back. Gibbs and IIF's Emre Tiftik tell Axios that poorer countries in Africa and the Middle East that have borrowed heavily — more than 25% of guaranteed bilateral credit now comes from China, up from less than 1% in 2007 — are some of the institute's biggest worries. The bottom line: In 2019 the global economy will face stresses it hasn't seen in at least a decade and central bankers and governments globally will be armed with fewer tools to fight them. 2. Is China really slowing? China's year-end economic data dump presented an ambiguous picture of the world's second-largest economy that analysts chose to paint in various ways by cherry picking data points. What they're saying: Some have been ringing the alarm of an economic slowdown in China, pointing to historically weak readings. China's economy expanded 6.6% in 2018 — the slowest annual pace the country has seen since 1990. In the fourth quarter, GDP growth came in at 6.4% year-over-year, the slowest since 2009. China's government has long been accused of padding the numbers on economic data, and some expect that weak readings like these are proof that the country's real economy is actually growing much more slowly. Yes, but: Also included in the data dump are a collection of strong data releases that don't fit the falling dragon motif. China's industrial output rose 5.7% year-over-year in December, more than the 5.3% economists were expecting. Fixed asset investment rose 5.9% year-over-year, nearly matching economists' predictions of 6%. Retail sales data rose 8.2% in December, up from November's 8.1% gain. Production in high-tech industries, strategic emerging industries and equipment manufacturing expanded 11.7%, 8.9% and 8.1%, respectively. When taken as a whole, the data reflects an economy that could be slowing or could be slowly turning from one driven by high-flying export growth to one sustained by a consumer-focused, service sector that Chinese government officials have declared they want. What to watch: For U.S. businesses, a clearer picture of what's happening could come this week when companies with significant revenue from China — including Starbucks, Wynn Resorts and Ford — report quarterly results. Truck shipments' year-over-year growth fell in December for the first time since 2016, data from the Cass Freight Index showed. Why it matters: Truck shipments are thought to be a leading indicator as they're very sensitive to market fears. When things are good, suppliers load up, but in hard times the oversupply of trucks and weak demand from shippers can lead to quickly declining rates and a prolonged downturn for the industry, often coupled with more widespread economic malaise. As the world's gross domestic product increases, the gains are being gobbled up by an ever smaller number of people, a new report from Oxfam finds. 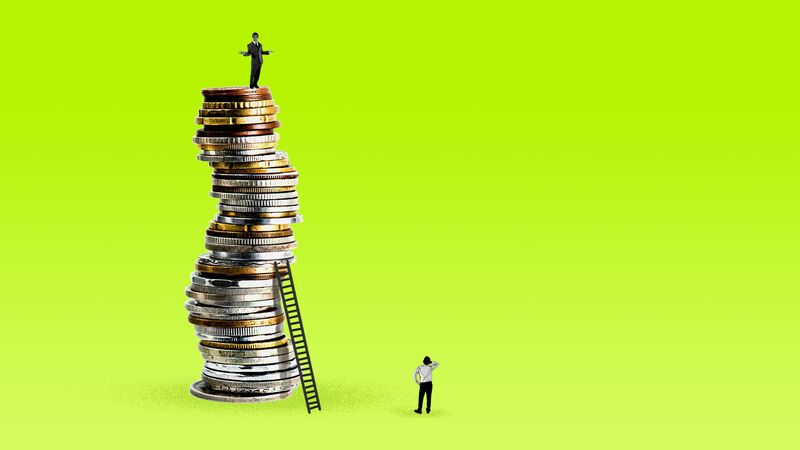 By the numbers: Last year, 43 of the world's wealthiest people held assets — cash and resources like real estate — that totaled as much as half the world's population. This year the number of individuals it took to match the wealth of the poorest 3.8 billion people on the planet fell to 26. Between 2017 and 2018, a new billionaire was created every two days. The wealth of the world's 2,200 billionaires rose by $900 billion in 2018, or $2.5 billion a day. Oxfam calls for a 1% tax on the world's richest to help close the wealth gap and asserts that it would produce enough money to educate every child not in school and provide health care that would prevent 3 million deaths. Previous reports have accused "big business and the super-rich" of "fueling the inequality crisis by dodging taxes, driving down wages and using their power to influence politics." That's a 50% increase from the service's 2018 prediction of 1,000 private jet flights. The website noted it ended up totaling more than 1,300 aircraft movements, an 11% increase from 2017 and the highest number on record. Important: The estimates do not include helicopter trips. 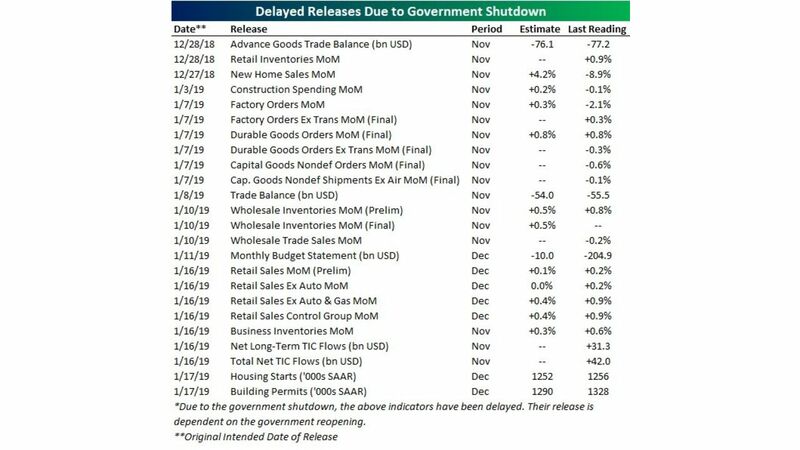 A list of all the U.S. economic data releases missed because of the government shutdown. As the U.S. government shutdown passes the one-month mark, Bloomberg notes, "There are more questions than answers about how and when the delayed data might get released. Even after the data begin getting released, it will easily take a couple of months before the Commerce Department’s release calendar returns to normal." Flashback: "A 16-day shutdown in October 2013 that affected a larger number of reports (because the Labor Department was closed as well) sparked doubts about the accuracy of some key measures for months afterward. For example, part-time employees weren’t able to go out during the shutdown to collect inflation data for the consumer price index." Check out my piece on the economic philosophy of Martin Luther King. Better yet, if you have an hour and seven minutes, listen to the good reverend doctor's 1967 "Where Do We Go From Here" speech. He goes deep on economic opportunity, income inequality, communism and capitalism, guaranteed basic income, labor rights, welfare reform, black nationalism, and much more.